Happy Birthday Justin Bieber! In any other world, I would have had absolutely no idea that it was Justin Bieber’s birthday. 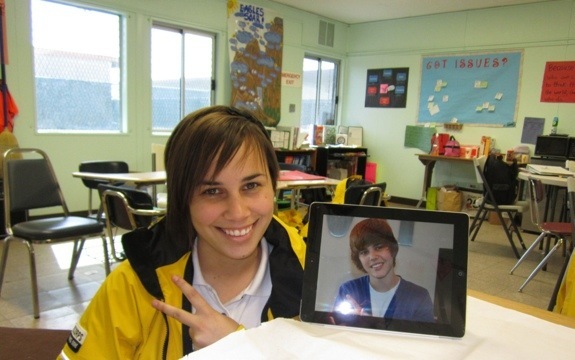 However, my students now call me Ms. Bieber, JB, Bieber, Liz Bieber and even gave me a couple of birthday shout-outs. This didn’t come out of nowhere. I recently got a new “wannabe hipster” haircut, which is asymmetrical. Everyone I know likes the new hair-do, but any drastic hairstyle doesn’t resonate well with middle school students. I can’t begin to count how many times students came up to me and said, “Why did you cut your hair?” or “I liked your old haircut!” At least with this drastic hair change they won’t confuse my teammate Charlotte and I. Last week, my teammate Daniel introduced a new initiative at Markham, “Make Your Mark on Markham”. Daniel has been working really hard to invite all of City Year Los Angeles to a service day at Markham. Our school is pretty bland – there’s not much that’s appealing to the eye besides the couple of random palm and pine trees and the three murals. Oh, but wait! The only three murals that were at this school – one that said “Watts”, another that said “Markham”, and another that depicted Florence Griffith Joyner, an Olympic track runner who graduated from Markham – were painted over last week. Our school has been under a painting project for a long while now, but I still don’t understand why they had to paint over the murals; none of the murals were defaced! There’s no explanation, except that it’s just another day at Markham Middle School. It’s alright, though, because Daniel’s initiative allows students to submit their drawings and ideas for murals of the three themes: anything they can think if, college success and peace in Watts. 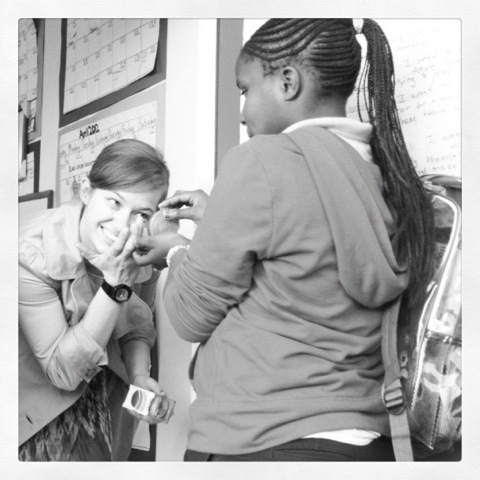 The winner will have he or she’s mural painted during spring break by City Year! A lot of my students are interested in submitting to the contest. I really hope this project brings a whole new atmosphere to Markham. If students see motivational quotes (I’m pushing for the “Hold Fast to Dreams” poem by Langston Hughes to be painted; this poem is a tattoo on my wrist and it reminds me daily to never give up on my dreams) it will make them happier to be at school. Right now, all I see at Markham is bricks, blank walls and metal gates. I know it sometimes depresses me to be here, so I can only imagine how the students feel about their school atmosphere. That’s all about to change! My students are still prepping for their next common assessment on five paragraph essays. My teacher taught them how to organize the introduction, thesis, body paragraphs and conclusion by color-coding the different topics. This helped them a lot with organization and I was really pleased with some of the final drafts. One of my students worked on the essay at home with his older sister and told me they had to stay up late and wake up early to get it done. The teacher and I were really impressed and proud of how much work he put into it and I made sure we praised him. You could tell he was proud of himself. It’s little moments like that that remind me again why I serve. Time is shortly running out and thinking about where my students will be in ten years is always on my mind. My math teacher presented a disheartening article from the United Teacher Los Angeles union’s newspaper. The article focused on Latino students, who are half of California’s student population, getting to college. The statistics said that only 13 percent of Latino CA students earn a college diploma. My students are working on probability and percents, so my teacher made these statistics into a math problem: If only 13 percent will go to college, how many out of a class of 25 will go to college? Only three. Yes, three. Such a sobering fact. Once again, I remember why I serve: to prove these statistics wrong. Maybe not all of my students will go to college, but more than three will. I thought it was a great topic to discuss with the students because it can motivate them to fight the statistics and take control of their lives and education. On Monday and Tuesday, my English teacher was sick. A substitute for two days = living hell. The kids morph into creatures, no sarcasm or exaggeration intended. A substitute can holler at my students all day long, but it’s just going to frustrate them and make them talk back even more. I can try and talk all the sense I can into them by telling them it’s not worth it to get sent to the office for talking back (or even bringing in City Year male authority), but they think they can get away with anything when the teacher isn’t there. They’d rather hang out with me than listen to me and see me as an authority figure. Substitute days scare me. I’m going to be a teacher next year and I can’t imagine trying to control a class like mine on substitute days. I would NOT have been prepared to have been a teacher right out of college. This year has given me a good understanding of classroom management and teaching styles that I will definitely use next year. Peace Corps update: I sent all my medical and dental forms last week, but the USPS never confirmed that the documents were delivered. The online tracking says the packages are still “processing in DC”. I freaked out and thought all of my medical forms were lost, but other PC applicants on Facebook reassured me that it takes up to four weeks to process the forms because any mail going to a federal building must be screened for anthrax, etc. Let’s just say I’m relieved. 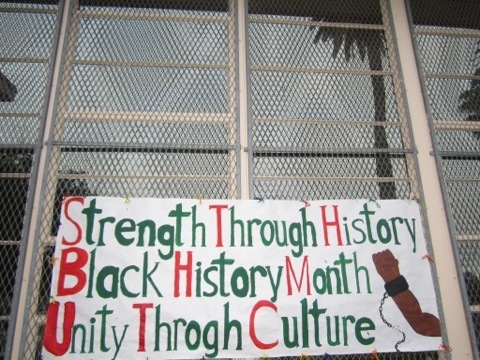 On Tuesday, Markham hosted a Black History Month event. Students participated in a talent show, arts and crafts and a raffle. On Thursday, my team went out to dinner after work to celebrate our teammate Angela’s birthday. This is one of my favorite pictures of the year; our students are always watching out for us! Adorable. Sometimes it’s nice to not be in uniform.